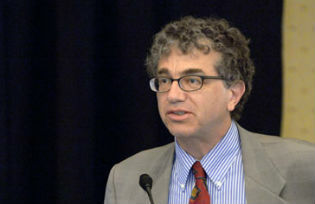 Jeffrey Frankel is Harpel Professor at Harvard University’s Kennedy School of Government. He directs the program in International Finance and Macroeconomics at the National Bureau of Economic Research, where he is also on the Business Cycle Dating Committee, which officially declares U.S. recessions. Professor Frankel served on President Clinton’s Council of Economic Advisers (1996-99); his responsibilities as Member included macroeconomics, international economics, and the environment. Before moving east, he had been professor of economics at the University of California, Berkeley, having joined the faculty in 1979. He is on advisory panels for the Federal Reserve Banks of New York and Boston, the Bureau of Economic Analysis, and the Peterson Institute for International Economics. In the past he has visited the IIE, the IMF, and the Federal Reserve Board. His research interests include currencies, crises, commodities, international finance, monetary and fiscal policy, trade, and global environmental issues. He was born in San Francisco, graduated from Swarthmore College, and received his Economics PhD from MIT. 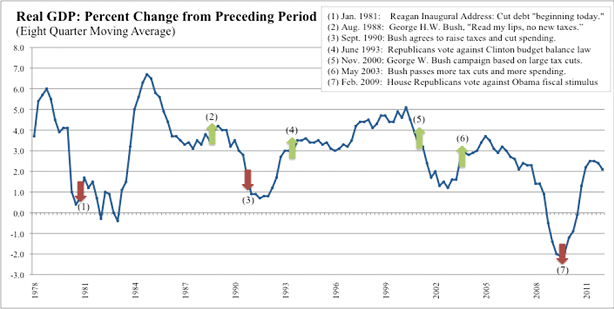 Second cycle: Predictably, the first President Bush and the Congress finally summoned the political will to raise taxes and rein in spending growth at precisely the wrong moment, that is, just as the US was entering another recession in 1990. (Recession: austerity.) Although the timing of the legislation was poor, the action was courageous. The ‘Pay as You Go Rule’ and other reforms switched government finances back onto a path that eventually was to eliminate the deficits by the end of the decade. Historically, developing countries used to be the ones where dysfunctional political systems produced procyclical fiscal policies. Almost all of them showed a positive correlation between government spending and the business cycle during the period 1960-99. But things have changed. Remarkably, during the decade 2000-10, about a third of emerging market governments – in countries such as China, Chile, Malaysia, Korea, Botswana, and Indonesia – managed to reverse the historical correlation. They took advantage of the boom years 2003-7 to strengthen their budget positions, saving up for a rainy day. They were thus in a good position to ease up when the global recession hit them in 2008-9. In fact a majority of the governments that have followed countercyclical spending policies since 2000 are in emerging-market or developing countries. They figured out how to achieve countercyclicality during the last decade, precisely the decade when so many politicians in ‘advanced countries’ forgot how to. Corsetti, G (2012), Austerity: Too Much of a Good Thing? , a VoxEU.org eCollection.